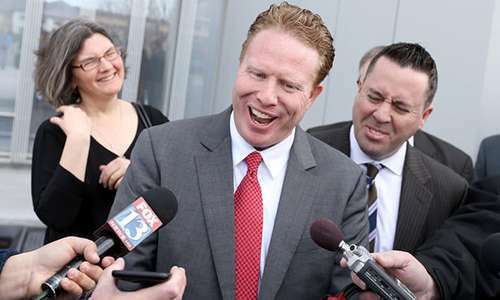 Utah businessman Jeremy Johnson, an important but unindicted figure in the 2011 “Black Friday” crackdown by the United States Department of Justice against US-facing online poker sites, has received a split verdict in an important fraud case involving the operation of Johnson’s iWorks telemarketing empire. 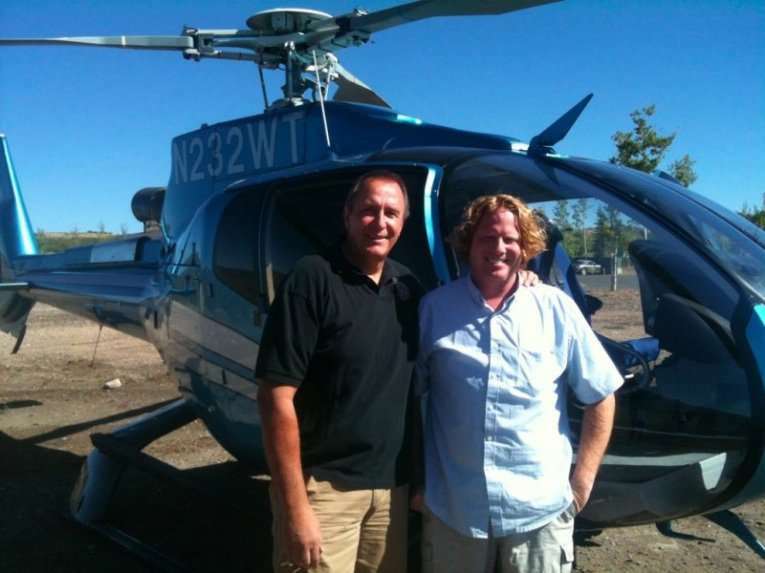 Former Utah AG Mark Shurtleff and accused fraudster and SunFirst Bank poker processor Jeremy Johnson in happier days, posing in front of one of Johnson’s helicopters. Johnson was found not guilty of 78 of the 86 charges brought against him in the widespread fraud trial that began in a Salt Lake City federal court several weeks ago. Most of the larger charges involving iWorks operations brought “not guilty” charges for Johnson, who represented himself at the trial. The eight charges on which Johnson was found guilty involved various charges of lying (making false statements) to a bank, in the process of creating dozens of shell companies to shield iWorks from a tide of consumer-generated chargeback complaints from the operation of the iWorks marketing scheme. Consumers were often hit with credit-card charges and program enrollments from iWorks without their knowledge, leading the Federal Trade Commission to file a $280 million fraudulent-practices lawsuit against Johnson, his business associates, and the dozens of corporate entities involved in the massive iWorks scheme. Jeremy Johnson was widely regarded in poker circles as the unindicted 12th individual defendant in the DOJ’s 2011 Black Friday case, due to his prominent role in creating the SunFirst Bank payment-processing channel through which sites such as Full Tilt and PokerStars temporary moved funds to and from US-based players. Johnson likely escaped being part of the Black Friday case because he was already the primary target of the FTC investigation, which began earlier. Court documents from the FTC case emphatically showed that Johnson and his associates freely commingled funds from the poker-related processing operations with those being used in the longer-running iWorks scheme. Both the iWorks operation and the online-poker processing were run in large part through SunFirst, a struggling St. George, Utah bank which in turn relied on business from Johnson’s widespread operations to stay afloat. Employees at the bank subsequently quipped to investigators that SunFirst was better known as the “Bank of Jeremy Johnson”. The SunFirst Bank operations also represented the nexus where the FTC (iWorks investigation) and the DOJ (online poker) drew a line to separate who would be be charged and prosecuted for what, even if it involved much of the same illicit activity. Johnson and several of his iWorks marketing and payday-loan associates faced charges brought by the FTC, while figures such as SunFirst Bank VP John Campos and independent payment processor Chad Elie were prosecuted within the scope of the DOJ’s online-poker investigations. Speaking of the recent Johnson verdicts, two of his close business associates also received decisions at the same time. Former iWorks general manager Ryan Riddle was found guilty on six charges of making false statements to a bank, but was found not guilty on 50 other fraud and money-laundering charges. And Johnson’s and iWorks’ lead accountant, Scott Leavitt, was found not guilty on all charges. Several other defendants in the iWorks portion of the case have previously pled guilty and been assessed massive fines, such as Johnson business partner Loyd Johnston, who was hit with a $7 million fine as part of his settlement earlier this month. Nonetheless, the split decision allows both prosecutors and Johnson himself to claim victory of sorts in the case, even though the guilty verdict on the lying-to-banks charges still leaves Johnson subject to millions in fines and possible decades of imprisonment, though such a lengthy incarceration is unlikely. Whether or not Johnson possesses the assets to pay the fines that are sure to be levied may remain forever unanswered. While Johnson has claimed a certain sort of pauper-like existence in the wake of the FTC-led case, tens of millions of dollars known to be generated via the online-poker payment processing has ever been accouted for. In a deposition taken several years back, convicted payment processor Chad Elie, who partnered with Johnson to put together the SunFirst operation, testified that Johnson secreted many millions of dollars worth of currency and precious metals in caches in the mountains surrounding Johnson’s southern Utah home, some in locations accessible only by helicopter. The testimony stands in stark contrast to the the circumstances of Johnson’s attempted flight from US authorities, when he was arrested at a Phoenix airport while carrying a shoebox holding $36,000. The Johnson verdict still does not represent the final episode in the long-running Black Friday saga. Johnson’s accusations against former Utah attorneys general Mark Shurtleff and John Swallow are a prominent part of the case’s now pending against those to two now-disgraced officials. The charges include widespread allegations of pay-for-play legal protection and destruction of evidence. Shurtleff and Swallow both figure into a scheme orchestrated by Swallow — and allegedly by the owners of the original Full Tilt Poker — to create official legal cover for the SunFirst processing operations in Utah. Johnsons allegation of a million-dollar bribe paid by Full Tilt to US Senator Harry Reid (D-NV) to float what later became the Reid-Kyl online poker bill could also have new life, once Reid retires at the end of this year as Senate Minority Leader and loses some of what Reid’s critics have claimed is political protection regarding the accusations.